What are Primitive Living Skills? As the April 30th deadline for the Spring Create & Cope Camp approaches, I thought it might be helpful to not only provide a sneak peak at the types of things your teen will be doing but share why I feel it is so important to overall health and well being. So let's start with Primitive Living Skills and why learning them are beneficial. WHAT ARE PRIMITIVE LIVING SKILLS? The word primitive means different things to different people. You may think simple, unsophisticated, basic, ancient, or out-dated. However, primitive living skills are truly the core survival skills which have allowed the human race to survive and even thrive in very challenging situations. The ability to make fire, create shelter, and find water and food sources is everything. Learning these skills were not optional and still are the most important skills to have in many cultures. Our "modern" culture has disconnected us from nature over time. Many of us have no idea how we would survive if we were lost or tragedy struck. WHY ARE THEY IMPORTANT? I have been fortunate enough to not only participate in Coyote Trails School of Nature Fox Trails but also to teach creative arts at two of their camps. What I experienced as a student was profound especially in terms of my connection to nature and the confidence I gained around survival skills. I witnessed many children and adults going from nervous and afraid of bugs and being in nature, to confident and connected to themselves and the earth. I saw my own children grow in confidence and become less scared to be alone in the woods, especially at night! It is my sincere belief that our disconnection to nature and lack of knowledge and skills create a great deal of anxiety. When we begin to learn how to get back to the basics, we feel comforted in our ability to survive should our cozy, modern lives ever be disrupted. In fact, these skills led me to feel confident enough to sleep outdoors, alone with nothing but water and a mosquito net for 3 days (2 nights)!! It was NOT easy or comfortable, and there may have been a full body rash from chigger bites, but I survived and I learned something about my resilience and courage I would never have learned otherwise. I am a far less fearful and anxious person because of these experiences and I feel strongly that I am not alone in this transformation. 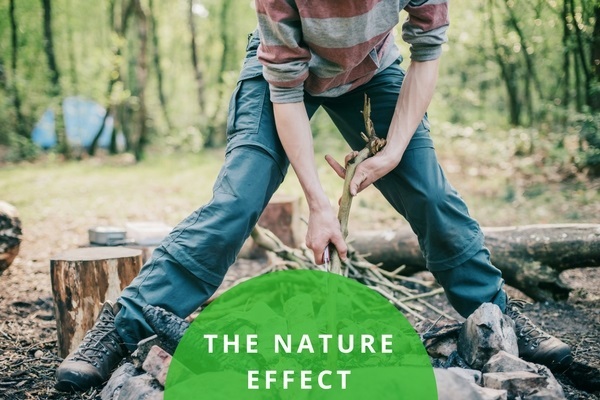 A TASTE OF CONFIDENCE: My goal in offering a seasonal one day camp that includes exposure to primitive living skills and nature awareness is to provide teens with a way to stay connected to nature and to learn how very powerful they really are. By teaching core survival skills, teens gain a deep sense of comfort knowing that they can provide for their basic needs if ever faced with a survival situation. I believe this confidence not only quells anxiety but encourages a curiosity and respect for nature that we so desperately need today. Join us MAY 19th in the Cuyahoga National Valley Park from 9-7pm for a day of connection and creativity! REGISTER BEFORE APRIL 30th!!! Learn why art therapy is such a wonderful, developmental fit for teens. Teen development is discussed along with the specific aspects of the art-making process which typically resonate with teens.